General elections throw up a lot of questions. Who shall I vote for? Is our electoral system the right one? Why are television debates so long? It can be hard to answer the questions, and harder still when they are asked of you by your children! There is so much to cover when explaining politics that I wanted some books to help children navigate the political landscape. Actually I found very few books on politics for children. There are many that serve an agenda, such as highlighting conflict or understanding refugees, but very few that simply define what politics is, what an election is, and how the system works. In the end I chose just three books. 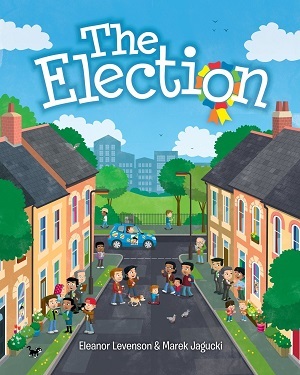 This picture book for young children explains what happens when two families support two different parties in an election. The parties are simply drawn and illustrated – one is spotty and one is stripy. The book defines an election, campaigning, debating and voting in simple language. The pictures show typical families in an attempt to illustrate that the election is something that affects everyone; there are drawings of a lady in a wheelchair, a person cycling, and people of different ethnicity and age. For the adult reader there are certain jokes contained within, such as a political reference to the Acropolis, the industrial revolution, and more mundane observations such as a Dad about to fall on marbles and various poses of people looking at their mobile phones. It’s not subtle, but it serves its purpose very well, and is the only book of its kind to illustrate a British election so succinctly and simply. Buy it from Waterstones here. This non-fiction gem explains the idea of politics from power and the different types of leadership through political ideas, the building of society, the economy and people’s rights. For me it works well because to explore politics, you need to have some understanding of history – and that’s what this book gives as well. 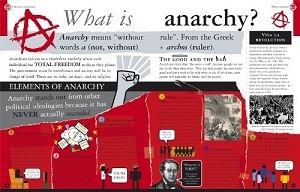 It illuminates ideas of democracy, theocracy, monarchy, anarchy, and dictatorship, as well as giving definitions of the state, a citizen, government, a politician, and isms. From the timelines showing how different civilisations were borne, to the introduction of monarchies and leadership, populations, and land as a way of explaining how different political systems were thought up and needed, to illustrating the different ideas of the state in a ‘rainbow of ideas’ from communism through to fascism, the book also explores capitalism, the economy and local politics. The beauty of the book is that it speaks in generalisations, rather than homing in on specific countries, leaders and governments, so that the child gleans a view of what is possible and why politics exists without forcing any agenda or giving room for pre-imposed political leanings. What’s more this isn’t a dry book at all, the graphics are exciting and playful – from a local politics jigsaw to a monopoly board of capitalism, flow diagrams, venn diagrams, comic strips, quizzes and a mix of illustrations and photographs. The foreword is by Andrew Marr, and it is great for reading through cover to cover, or just dipping into for a particular topic. This served its purpose very well too. You can buy it here. Lastly, I wanted to have some fun with politics. After all, I grew up on Spitting Image – there was no greater vehicle for getting people young and old interested in politics. Tom McLaughlin’s book manages to introduce the idea of politics for a 7+ readership with some serious points, but mainly with laugh-out-loud humour. It tells the tale of Joe, who makes one great speech that goes viral, and he ends up as prime minister. 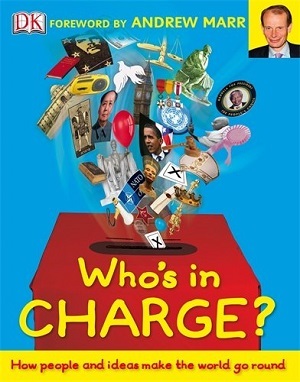 There are slight misrepresentations – most of our prime ministers were voted in, not just handed power – but the book makes some serious points amongst all the silliness. It begins by bringing politics to street level – Joe’s ambitious speech starts because the government want to close his local park, and he wishes to keep it open. 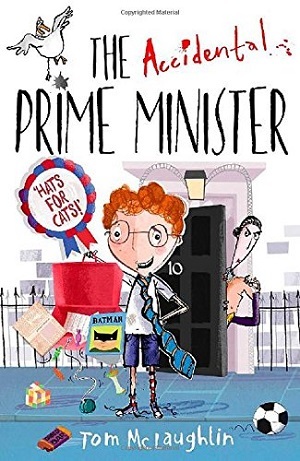 Other serious points include those adults who are just in politics for the ego-trip, the ‘spin’ that can be put upon events, and the randomness of war – but essentially the book is packed full of humour – because what would happen if a twelve year old were in charge? There are jetpacks, bouncy castles, a Queen who rollerskates, ice cream and whoopee cushions, and the author’s delight in writing this satire comes across with his very 1980s pop song chapter titles, including Fame, Parklife, Don’t Stop Me Now, as well as his parody of Thatcher’s famous speech: “Where there is grumpiness, may we bring giggles”. A riotous laugh. He also illustrated it himself with some winning cartoons. Grab yourself a copy before the election, click here.